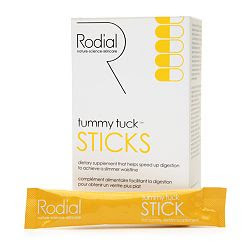 Here's a new one for us: the Tummy Tuck Sticks by Rodial which promise to flatten your tummy by decreasing the bloat. The ingredients green clay, fennel seeds, pineapple and papaya shrink your belly by getting rid of the gas. We know that fennel seeds aid in digestion (that's why they're served at the end of Indian and Middle Eastern restaurants); but we'll have to test the Tummy Tuck Sticks ourselves before we can attest for the combination. To use, empty the contents of one of the sticks in a glass of water and drink. You can find the Tummy Tuck Sticks at Beauty.com. This could be a great way to prep ourselves before our next trip to the beach.